Sunday, April 21st - CLOSED - Happy Easter! All other days, our regular hours can be found below! 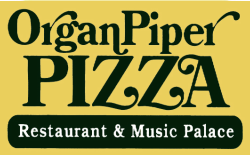 Note: While we are closed to the public for weekday lunches and Monday evenings, the Organ Piper can always be made available for large private parties. See our Group Information page for more information. Whether you're planning for a soccer team, baseball team, volleyball team, birthday party, wedding rehearsal, anniversary party, or just a night out with family or friends, we're the place for you! For more information on reserving your party, visit our Group Information page.